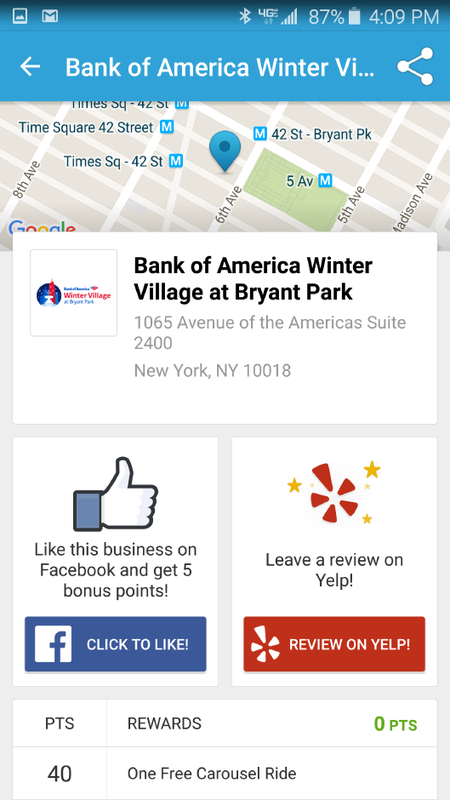 Bank of America Winter Village at Bryant Park has the pleasure of having 'regulars,' those park patrons who come back week after week to skate, shop, eat, and see what's new. This year we are launching a loyalty program that will reward our repeat visitors. The program, called Polar Perks, is powered by Belly, a leading national loyalty app. There is a Polar Perks iPad in the Skating Pavilion, right by Bag Check. 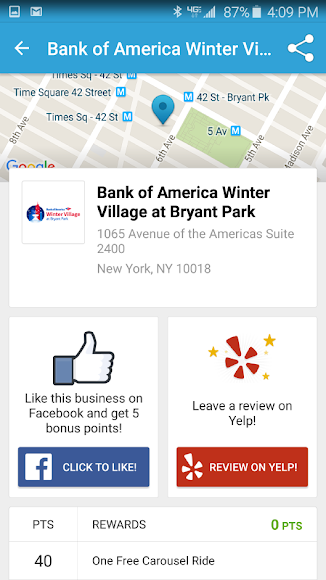 Download the Belly app on your phone, or pick up one of the cards at the Bryant Park Shop and Info kiosk. Link the card to your email address to start earning points. The Rink (Polar Perks iPad is located by Bag Check); The Shops (Polar Perks iPad is located at Bryant Park Shop and Info kiosk); and Celsius (Polar Perks iPad is located by entrance to Celsius) The first two iPads are up and running, and the third will be in place by week's end. You can check in once per location per day, for 5 points per scan, for a total of 15 possible points per visit to the park. The Belly interface is easy-to-use, even if technology isn't your thing. What if I forget my card? You can sign in with an email address to get points without your card or the app. You cannot redeem rewards, though, with just your email address. Where do I redeem my points when I earn rewards? Most rewards can be redeemed at the Bryant Park Shop and Info kiosk. 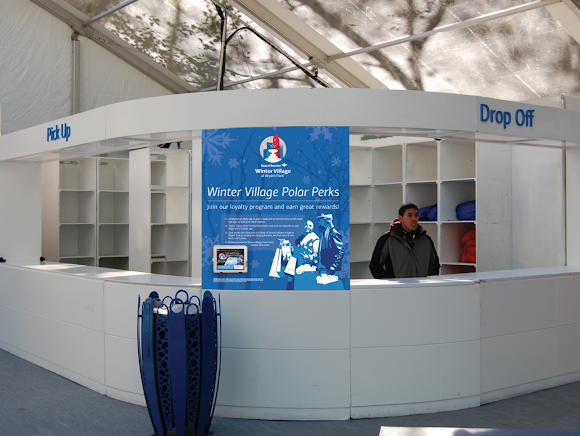 The Bryant Park Shop and Info kiosk, where you can redeem your points for rewards. Rewards are sometimes available in limited quantities. This cute Winter Village drawstring bag is worth 200 points. What is the difference between rewards that appear gray, and those that appear blue? earned it! You can redeem it at the specified location. Will you use my email? Is purchase required to earn points? No purchase is required. Simply walk up to any of the Polar Perks iPads to scan your card or phone. If you have any questions, visit the Park Shop and Info kiosk, which is also Polar Perks Headquarters! You can also call 212-768-4242 and speak to a staff member.